Bell's Vireo has significant wingbars which will differentiate it from Warbling Vireo when seen well. However, if one is looking up, the wingbars may not be visible. On Bell's Vireo, there is a noticeable yellowish wash on the flanks and belly. 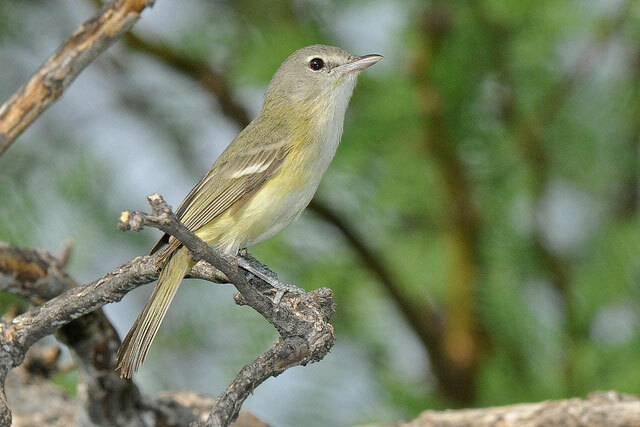 Warbling Vireo has a grayish-green cast to the underside, not yellowish. Warbling Vireo is also a bit larger by more than a half-inch. Both birds are very vocal which may eliminate the need for complete visual identification. Status and Distribution: Warbling Vireo is a fairly common migrant and localized nester in the study area. Bell's Vireo is an uncommon-to-rare migrant and very rare nesting bird.